The Institute for Creation Research, the first full-time organization dedicated to creation science research, has grown tremendously since its inception in 1970. Financial support was rather lean during the early years, but God was faithful to supply as believers responded to monthly updates in Acts & Facts and occasional appeals. Today, everyone at ICR shares my deep sense of gratitude for those who financially labor with us in ministry. Lord willing, we are prayerfully confident this support will continue. That said, major projects rarely move forward without large gifts to underwrite them. ICR’s own history bears witness to this. Significant gifts were vital to research projects such as expeditions to Mount Ararat in the ’70s and ’80s and our landmark RATE initiative over a decade ago. They also made two major location moves possible, the first into our own facility in San Diego and the second to our current multi-building campus in Dallas. In California, they funded new office construction and heavily underwrote our first museum. In Dallas, they enabled ICR to hire personnel, make needed renovations to our facilities, and purchase property for the ICR Discovery Center for Science and Earth History. Large gifts even made possible our quarterly devotional Days of Praise, an outreach offered free of charge for four decades. 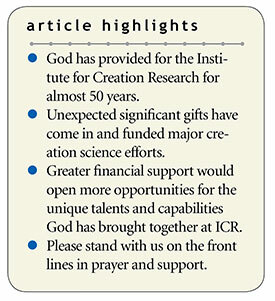 These significant gifts helped make ICR a better, stronger, and more effective ministry for God. Too strong a focus on big gifts can lead to real dangers, however, so please don’t misunderstand me. Smaller gifts are essential to ICR’s ministry, and we remain debt-free as a testament to God’s provision through faithful supporters and our careful stewardship of the funds He has granted us. But we cannot ignore the impact that significant gifts have made in the past—and can make in the future. Frankly, large gifts are often the missing ingredient needed to unleash the full potential of ICR’s capabilities. Placed into proper perspective, consider that less than 0.05% of the gifts ICR received over the past decade were valued at $25,000 or more. And of these, roughly a third came from estates of long-time supporters the Lord had called home. Nearly all of these substantial gifts were unsolicited and came as a complete surprise to us, often arriving at critical times just when the ministry needed them most. God has been good to us, but greater financial resources would open more opportunities for the unique talents and capabilities He has brought together at ICR. There’s so much more we can do, if God enables it. ICR has the scientific muscle, intellectual prowess, and biblical commitment to combat these threats, but not without considerable help from God’s people. The battle has escalated to new heights in recent years, and our adversary is “roaring” like never before (1 Peter 5:8). An entire generation is growing up in a world beset by amoral cultural norms that dispute, devalue, and disparage the most basic of biblical doctrine. ICR has the scientific muscle, intellectual prowess, and biblical commitment to combat these threats, but not without considerable help from God’s people. ICR’s current initiative, the ICR Discovery Center for Science and Earth History, is poised to advance the cause of our Creator through the public display of scientific evidence that confirms the Bible is right and its message is true. We can impact coming generations with evidence that destroys evolutionary speculations—but only if God’s people help us move the ministry forward in 2019. If there ever was a time to help ICR and the Discovery Center, now is that time. Pray for us, and please help if you are able. Cite this article: Henry M. Morris IV. 2019. Better, Stronger, and More Effective Ministry. Acts & Facts. 48 (3).